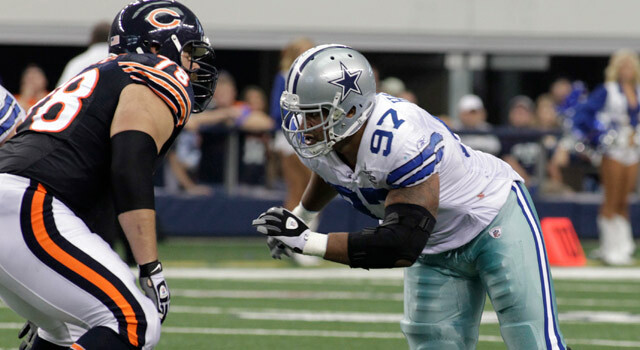 Published: Aug. 17, 2011 at 12:02 p.m.
Jason Hatcher is afraid of elevators? Don't worry, you are in good company. Dean Martin was afraid of elevators. It is true. So while I don't know what the word is for a fear of elevators, fearing an elevator is forever cool because of Dino. One of my big fears has been to get trapped in an elevator. That is why elevators should have emergency flasks in them. I thought about an emergency 12-pack, but then you'd have to use the restroom -- so a flask would be the best bet. A fear of elevators also envelops Cowboys defensive end Jason Hatcher, who was actually caught in the elevator of his team hotel this week. Hatcher tweeted about his experience and escaped unharmed while crediting Twitter for keeping him sane. But what if you were alone in an elevator without cell reception? Or worse, what if you were stuck in an elevator with these individuals? That is right, here are the six people you would not want to be stuck in an elevator with. Considered: Hugh Jackman. Just because. Considered: Matthew Stafford and Reggie Bush. You might think it would be cool to be stuck in an elevator with these guys, but consider that both of them would likely get hurt trying to open the door, knocking them out for at least six weeks. Considered: The Never Miss a Super Bowl Club. Why? One of the most underrated stories of Super Bowl XLV was that one of the "Never Miss a Super Bowl" guys died the week of the game. Why? Because they tempted God. Notice that it was the Packers fan that was struck down, too. Listen, I don't want to be mean to these guys; I met one of them at the Super Bowl and he was awesome. I would just fear that they are going to be picked off like a Cocoon-version of Final Destination. Have you ever been stuck at a social function where some loon corners you and tries to convince you of the latest conspiracy theory about the JFK assassination, or that Michele Bachmann is really a viable presidential candidate, forcing you to nod your head and smile politely? Mendenhall is that guy. Good lord, have you seen the way Smith behaves when he believes the pocket is closing in on him? Imagine how much worse it would be in an elevator as Smith freaks out thinking the walls are closing in on him. Remember the recurring scenes in Airplane! where Ted Stryker would sit next to a passenger on the plane and regale them with love stories? What would happen next would be that passenger taking his or her own life in horrific fashion. That is what being in an elevator with Joe Buck would be like. One of the more reassuring things about being stuck in an elevator with somebody would be the small talk. Unless it were Rosenhaus. Could you imagine how this would end? Hey, how is it going? "Next question." Come here often? "Next question." Yeah, that would get awkward quick. And being stuck with Morris would be the exact opposite, as the former Dolphins running back would drone on and on about Miami's perfect season in 1972. Or worse, Morris could start talking about his theories of life, leaving you to beg for champagne toast stories (if he had one). Oh wait, irrational Peyton Manning fan is redundant. But yeah, being a captive audience to a lecture on how Manning is really better than Joe Montana is not a great way to spend any amount of time. That applies in and out of elevators. Be the first to say "I would hate to be on an elevator with Adam Rank" in the comment section. Or hit him up via Twitter or via Facebook. Be sure to catch the latest on the Dave Dameshek Football Program. "Six more outlandish things that Eli believes..."